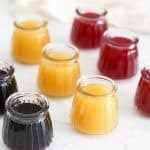 These apple cider vinegar shots are a tasty way for you to improve your gut health and digestion, and boost your detox and your metabolism. Mix the ingredients together for the desired apple cider vinegar shot and store in a sealed container. I like to store these in 4 ounce jars, and drink about 1 ounce prior to meals and snacks to prep for digestion.